Dining out is surging—yet there are reservations. Do we lose something important when we dine out too often? How have you handled these issues in your household? Share your thoughts and see other readers' answers. In 2003, Ferran Adrià appeared on the cover of the New York Times Magazine, becoming only the second Spaniard, after Salvador Dalí, to do so. Like Dalí, Adrià is both an artist and a kind of surrealist. His restaurant, elBulli, on the Costa Brava north of Barcelona, has attracted every honor a chef could hope for. In 1997 Guide Michelin awarded it a three-star rating, making it then only the third such restaurant in Spain. (There are only 96 Michelin three-star restaurants in the world today, and just nine in the United States.) The industry benchmark, Restaurant Magazine, declared elBulli the top restaurant in the world a record five times between 2002 and 2009. Adrià has little interest in preparing the world’s best bouillabaisse; what would interest him might be turning the ingredients of bouillabaisse into a pyramid of foam that tastes exactly like bouillabaisse should. He has served ravioli made of transparent agar-agar jelly rather than pasta, putting the filling on view. For the “nitro caipirinha” cocktail, a waiter trundles in a trolley with liquid nitrogen (at -196 degrees Celsius), which precedes the cocktail into the drinking vessel and instantly freezes it to a sorbet: the guest then eats the cocktail with a spoon, before it melts. 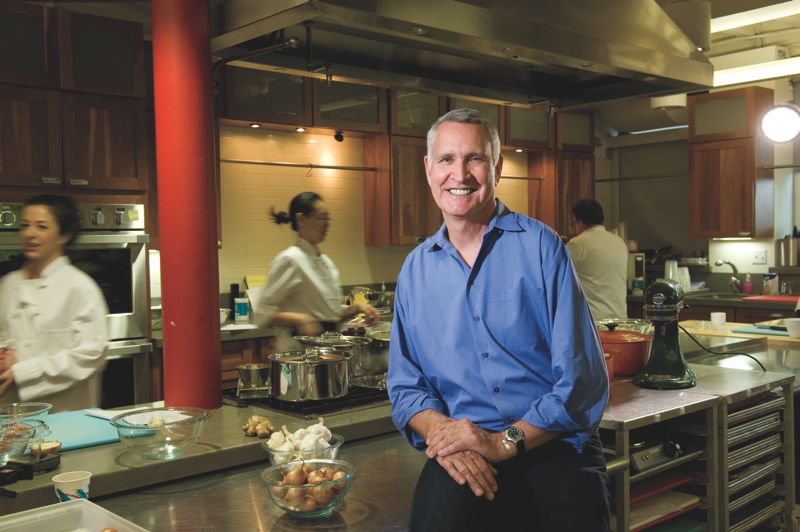 Since 2003, Katzen has been a consultant to the Harvard University Dining Services (see “Delicious Minimalism,” September-October 2006, page 32) and is co-creator of its Food Literacy Project. She is also a charter member of the Harvard School of Public Health Nutrition Roundtable. “I love going to an ethnic hole-in-the-wall that serves, say, a beautiful Vietnamese pho,” she says. “But for American, nouvelle, fusion, French, Italian, it will still be a six- or eight-ounce hunk of animal protein in the center of the plate and some token vegetables. I want a maximum of three ounces of meat or fish and at least 80 percent of my meal to be plant foods. Entrées are never less than $25 anymore, and I often end up feeling I had way too much salt. Insecure chefs salt up the food—I’ve had to send $30 plates back because the food was so salty that I found it inedible. It just doesn’t feel that honest to me; the creativity is a little too fraught. There’s a lot of ego on that plate. The simple fact, though, is that Americans are eating more of their meals away from home. The National Restaurant Association reports that the fraction of Americans’ food budgets spent in restaurants has about doubled since 1955, from 25 to 49 percent. Restaurant industry sales have zoomed up from $42.5 billion in 1970 to an anticipated $604 billion this year: adjusted for inflation, a 2.5-fold increase. Those restaurant meals are in large measure replacing home-cooked ones—a transformation that affects our health, weight, finances, and family lives. Yet “home-cooked” retains an irreducible cachet; its positive associations are so strong that restaurant menus often tout “home-cooked” items that are, of course, nothing of the sort. Restaurants have also changed vastly since the 1950s. About half are now fast-food establishments, a category that has burgeoned in recent decades. Adding table service, as at Denny’s or International House of Pancakes, moves establishments up a notch to “family dining.” Add a liquor license (and omit breakfast service) for the “casual dining” category, where average 2009 checks ranged from $11 to $20 per person in the “Big 7” chains: Applebee’s, Red Lobster, Chili’s, Olive Garden, Ruby Tuesday, Outback Steakhouse, and TGI Friday’s. At the pinnacle of the restaurant pyramid, “fine dining” draws loads of attention on food programs but only 1 to 5 percent of the market. Fine-dining places typically serve only dinner, mid-scale eateries offer lunch and dinner menus, and low-end places cook all three, or just breakfast and lunch. Time spent at a restaurant rises with the bill. Gourmets and gourmands linger hours over multicourse French dinners, but at fast-food eateries, customers may never even set foot inside—they simply buy meals at a drive-through window. The growth of fast food has clearly increased the number of meals eaten out, if not their unit cost: eating breakfast at a restaurant was once a special occasion, but now McDonald’s tries to persuade commuters to stop by every morning for a coffee and Egg McMuffin. The pace of meals, and their circumstances, can influence menu offerings. “Urban sprawl and urban flight have made commute times longer, squeezing out time for breakfast at home,” says the business school’s Norton. “People leave for work at 6 a.m. and eat in the car. Food design takes this into account: can this be eaten in the car? That’s one reason we see so many sandwiches and bite-sized foods like Chicken McNuggets appearing in the marketplace in recent decades.” Cizik professor of business administration Clayton Christensen notes that in designing milkshakes for commuters, vendors may choose an optimal thickness based, not on taste or texture, but on the duration of the average commute, which dictates how long the milkshake should last before melting. Riis and his colleagues have tried asking patrons in fast-food eateries if they might like to try “downsizing” instead of “supersizing” their meals. Even without any price discount, about a third of the customers were willing to take smaller portions—an option not usually offered. Riis’s investigation suggests that offering varied portion sizes could reduce restaurant expenses while still satisfying customers. Ironically enough, along with the burgeoning of restaurants has come a simultaneous revival of the domestic culinary arts. That movement may have begun with Julia Child, but now embraces thousands of books, magazines, and 24-hour television outlets like the Food Network, legions of websites, gourmet foodstuff suppliers, and grassroots savants in their home kitchens. Call it the Williams-Sonoma revolution: by any name, the new passion for good home cooking may represent a countertrend to the influx of restaurants. Thus, a central challenge for home-cooking advocates is to give people confidence that—much of the time, anyway—they can make better food at home than they are likely to get in most restaurants. “There will always be a future for home cooking,” Willoughby says, “because there are people who like to cook, and people who have to cook. Plus, it has a social payoff: cooking for yourself or your family leads to social cohesion. And it can be fun!” Cook’s Illustrated, the magazine Willoughby works on, and the related PBS television show, America’s Test Kitchen, stick to practical matters: “How do I make mashed potatoes so that they come out every time the way I want them?” as he puts it.